Older Single Mum: Who's a Beautiful Blogger? 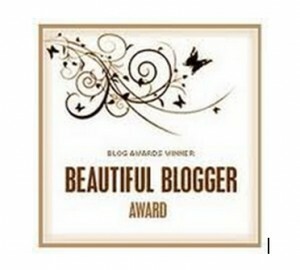 I have been honoured by the Tres Jolie Polly at Caught Writing with this Beautiful Blogger Award. I am thrilled and touched (but not like that 'in the head' kind of a way, although others may beg to differ), thank you. There are rules which always come with accepting these things. I must nominate (about) six Beautiful Bloggers and tell ten facts about myself that others may not know. I have already done a bit of the latter on my Versatile Blogger Award post a while ago and some of it was serious stuff, so less of that this time. Here are some of my Beautiful Blogger friends. All are ladies I have met IN THE FLESH and are credits to their blogs. The first four were at a Save the Children conference and the last two were at the Tesco Real Food Cooking Event. 1) Michelle at Mummy Rates It . Witty frivolity. Top lady. Top blog. 2) Luci at mother.wife.me. A fellow Montessori Mum. Ex Journo / PR / Media. Writes very interesting, varied, often thought provoking, proper stuff. 3) Sarah at Grenglish - a name derived for writing about the mixture of her Greek husband and English self and their son. Again, an entertaining read. 4) Ruth at dorkymum writes about politics, her much older husband and their son, with fun and frank, common sense. 5) Jenny at Cheetahs in my Shoes showcases the most beautiful scenic photos, is a baker extraordinaire and shares all her stuff with us to make a deeply personal, enjoyable blog. She has started a second one just for her pics. 6) Am I allowed to mention Tania from Larger Family Life again? Mother of 11, 12th on the way. Normal mum, socking it to us. I can't wait for the Summer, just so as I can make a jug of Pimms. I grow two sorts of mint in the garden, one especially for it. The other is for making fresh peppermint tea. I love to be by the sea shore - right by the water's edge, when it's blowy, but sunny. I don't mind Barbados, which ticks all the boxes. Otherwise, the sea at the end of our street is fine. I always fall for the Saxophone player in any band. It doesn't matter how ugly they are. It's probably a good job I don't get out much nowadays. I have an ambition to learn to play the piano one day. Don't know when. Don't know where. Don't have one yet. I have been to Australia, Russia and China, worked in London and New York (plus a bit in Switzerland and Los Angeles) and spent four years living and working in Jersey, Channel Islands. I love Reflexology, Shiatsu and all things massage, facials, waxing and relaxing - anything that means I can lie down in the middle of the day, but am well out of practice, just as it would really be of benefit. I am already programming my seven year old to find a good woman and get married so that he can give me granchildren before I pop off the planet. That's what happens when you don't become a mum until you're 41. I am already programming my three year old to play cricket for England, or at least get him and his brother (equally as good at his age and still brilliant but not as brutish) into Scholarship Private Education. I don't write anything on my blog unless I think it will make you laugh. Hand soaps - the posh smelly ones - I love 'em, but won't buy them unless they're on offer and then I end up pining for them (excuse the pun!). Whilst plundering my brain for these silly somethings, it has sprung to re-mind me of a similar Seven Secret Things tagged post too, if you haven't had your fill. Looking forward to my chums' stuff now! You have sea at the end of your street? You're the second cyber friend in a week to reveal this painfully enviable privilege! Exactly what I was going to say! You must live in the same kind of built up suburbia as me! Yes we do - just outside of Brighton. It's not exactly sand between the toes stuff like Barbados, because it's pebbly, but it's my solace. Thought you might envy my mint growing skills? Ah Ha! I'm in the middle of writing this post too! You are a bag of interesting facts .... but the one I'm most intrigued about is your attraction to man + saxophone. Pray tell ... what is it about the saxophone? And you are very well travelled! Do you still intend on tracing your biological father? Thank you for including me in your 'beautiful list' as I've said before your encouragement and kindness has really touched me. Thank you. I did laugh at you growing mint just for Pimms. I can't believe you've held off until now? Maybe that will be the 'tonic' for giving you back your mojo? And haven't you travelled! Have you blogged about all those places? I'd enjoy reading those. Raising a virtual glass of Pimms to you for including me in this! I want the sea at the end of my street tooooo!! Though only if we move to live by the coast, not if London got flooded in some freak tidal wave thing. Thank you so much for including me! It was fab to be introduced to Grenglish - her family is like ours in reverse (me = Greek - dh = English). Anyway, I wrote a ten things about me post a couple of weeks back at http://www.largerfamilylife.com/2012/06/27/linky-getting-to-know-you/. Will add this post into it. You're welcome to be included - just couldn't NOT include you and I remember your ten things about you post - so hoped you could link it. Great news about you and Grenglish. Now there's a glass of wine and an evening's entertainment! We may have to get rid of our piano. I'll let you know if we do. Mmm Pimms! Oh what I would do for a glass of Pimms! You always strike me as a classy kind of lady. I adore the fact that you grow a special kind of mint in your garden especially for Pimms. Fabulous. I think you and I would get along very well! Thank you so much - yes I'm sure we will!